Rdio, Spotify, Bandcamp, QRD, Upcoming Releases, Etc. One Response to Rdio, Spotify, Bandcamp, QRD, Upcoming Releases, Etc. Albums – get the next ten albums & receive all EPs released in interim free for $50. 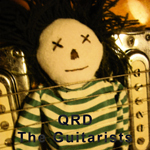 QRD – The Guitarists Compilation is finally out!